Portable and planet-friendly, too, YOGO is a foldable yoga mat that shrinks to the size of a newspaper. Designed to travel to the studio or in a suitcase, it weighs under three pounds. Made from grippy natural rubber, it’s biodegradable, recyclable, and easy to keep clean, too. Because the origami-inspired design folds, the top side won’t touch the dirtier underside. When it does need cleaning, just hang it to wash and dry. Dimensions: Regular: 68" x 24" x 0.06"; Long: 72" x 29" x 0.08"
Weight: Regular: 2.4 lbs. ; Long: 3.4 lbs. Practice your downward dog anywhere. 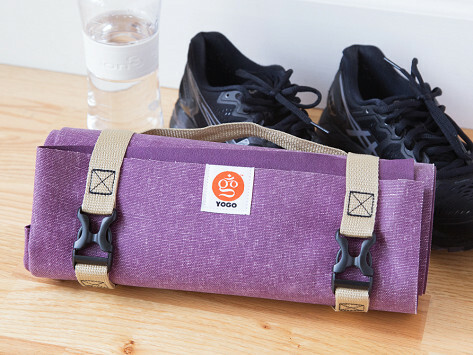 This foldable yoga mat becomes newspaper-sized to travel around town or in a suitcase. And it weighs just a little over two pounds. YOGO mats use grippy natural rubber, sourced from sustainable (non-Amazonian) tree farms. This stickiness gives the mat some floor traction and more stability as you stretch. The lean design also stays cleaner than most mats. 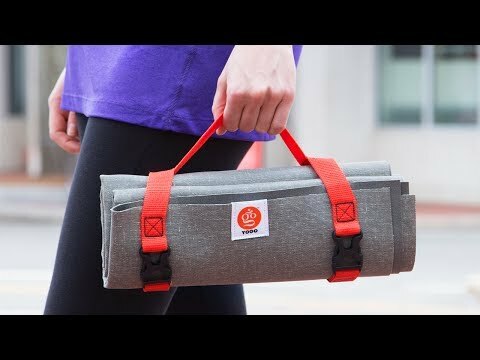 Instead of rolling it up, which makes the top of the mat touch the underside, YOGO has an origami-like design that folds with two attached straps help it stay folded. You can also use the straps to hang your mat in the shower for a full-fledged scrub or hose down. The YOGO folks’ commitment to the environment is evident in everything they do. The entire mat is biodegradable or recyclable and, for every mat sold, one of YOGO’s partner organizations plants a tree where there’s a need. This portable, planet-friendly mat won’t weigh you or your conscience down.